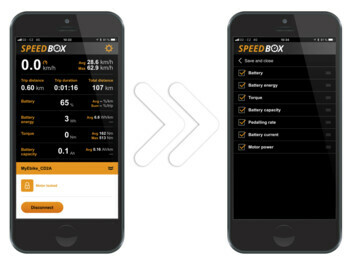 SpeedBox B-Tuning is primarily a tool for electro-monitoring and diagnostics using a smartphone. 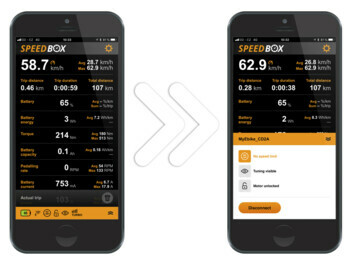 The application uses bluetooth to capture data and display driving parameters. You can save individual trips, compare your results with friends, and watch your own performance. SpeedBox Tuning B-Tuning delivers e-bike speed unlocking . The assistance of an electric engine is not limited by the limit of 25 km / h. Tuning can be controlled directly from the application or via the WALK button. The application also offers the option to completely hide tuning. After activating the Hide Tuning feature, you can no longer turn tuning on with the walk / light button on the electric boom. However, you can still activate it in your mobile app. At the same time, this product is the safety supplement of your electro. In the mobile application, you can temporarily switch off the powertrain engine and add an extra level of security. This prevents misuse and unauthorized manipulation of the electro-bike. On your phone, you can easily see the available data from your electricbike. Most sports apps only use rough estimates of values. These values ​​can vary by up to 20% from true electro-technical data. SpeedBox, however, displays completely real-time data from the electric control unit - in real time!